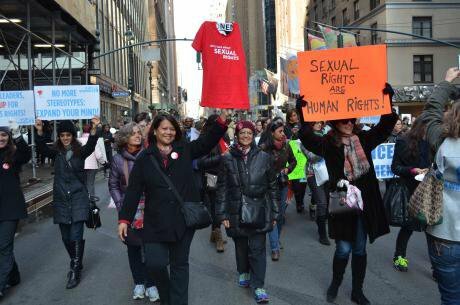 International Women's Day 2015 in New York City. Photo: IWHC.Women’s rights are under attack around the globe, with progress threatened in many countries. Yet feminist organisations continue to fight back, mobilising and forming new alliances. At this challenging moment, much can be learned from the success of the global women's movement which profoundly influenced the United Nations’ current international development agenda. Agreed in 2015 by 193 governments, this agenda guides global development policies, programs, and financing until 2030. Its 17 sustainable development goals (SDGs) and 169 targets focus on challenges including poverty, climate change, world peace, and gender equality. Unlike the previous millennium development goals, women’s rights underpin much of this agenda. 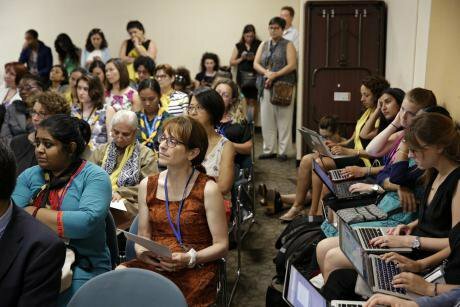 Amid conservative backlash against women’s rights, how did feminist advocates ensure that the SDGs focused on gender equality and other issues critically important to women? What strategies did the women’s movement use to influence this agenda? Last year, the International Women’s Health Coalition (IWHC) published a study – “Power Lessons: Women’s Advocacy and the 2030 Agenda” – on precisely these questions. Along with a related, short film, it documents and reflects on the years of analysis, coordination, alliance-building, and engagement with policy-makers that went into shaping the agreement. UN negotiations have challenging, fast-paced dynamics and are often New York-based, limiting the participation of small and local women’s rights groups particularly in the Global South. This is one of the challenges that the Women’s Major Group (WMG) – a coalition of more than 600 women’s organisations and networks from around the world – sought to tackle. The group, which is the focus of IWHC’s study, restructured its leadership to include regional representation, and raised money for women from the Global South to travel to attend the SDG talks. Online organising enabled virtual participation. One WMG member said: "It became easy because people felt included and valued for their contributions." High-Level Political Forum (HLPF) Side Event - A Feminist Accountability Framework: What the World Needs to Achieve Gender Equality and All the Sustainable Development Goals. Credit: UN Women/Ryan Brown/Flickr. (CC BY-NC-ND 2.0) Some rights reserved. The WMG also brought together activists and organisations working across different issues and representing diverse peoples. They embraced others' concerns, learning from each others’ areas of expertise. One participant said: "This is the story of the beauty of engaging more and more organisations and seeing what the added value is and how different people of different networks work." More than three years before the 2030 agenda was finalised, women’s groups held regional and global strategy meetings to start linking issues, prioritising demands, and developing clear, unified positions. "The women's movement pulled something off which a lot of people would have thought wasn't possible, which was to actually develop one single common platform of women's rights,” said another participant. “It covered every single issue that we knew was in play. That was extremely hard to do." The WMG also skillfully mapped allies in government and UN agencies, and developed technical language for negotiators to use in talks. "We talked to every government that was present in these negotiations to say, 'This is what we want, and this is why it's so important,’” said one member. "We talked to every government that was present in these negotiations to say, 'This is what we want, and this is why it's so important." Lessons we can draw from this experience include: the significance of building transparent and inclusive structures and processes; organising early; prioritising demands; developing clear, unified positions; identifying champions; building relationships; and putting persistent pressure on decision-makers. Of course, the women’s movement also faced a number of challenges. The IWHC study for instance identified fierce opposition on sexual and reproductive rights, as well as resistance to progressive demands related to global financial structures and systems. Women’s groups had to balance bold demands with political pragmatism – working within the boundaries of what governments might realistically accept, while still pushing the agenda as far as possible. Despite continual fundraising, limited budgets were an ongoing constraint. Women described solidarity and advocacy on the SDGs as an example of what can happen when feminist organisations come together to use a political opportunity to fight for rights and social justice. The impact they had shows the power and necessity of strong women’s rights movements. The 2030 agenda is not perfect. But gender equality is woven throughout its goals and targets. Amid volatile geopolitics and narrowing space for civil society, feminist advocates will need to sustain the intersectional approach they took to influence the SDGs. Inevitably, governments will "cherry pick" the most politically expedient goals and targets to focus on. Some states are already backtracking on critical issues, such as sexual and reproductive health and rights, property rights, and challenges to the economic status quo globally and nationally. At the same time, some governments are taking action and reallocating funds, showing political will to implement the SDGs. Feminists should take advantage of such opportunities and push to ensure that the goals are realised.